As a perfect example of the saying 'opposites attract', Horror and Comedy seem to go well together, and in the movie business Comedy Horror is a well-defined genre. From early examples by Abbott and Costello (when they meet "The Mummy") and the Carry On series ("Screaming") through classics such as "Young Frankenstein", "An American Werewold in London" and the "Evil Dead" series right up to the more recent "Shaun of the Dead". It's probably something to do with cathartic nature of tension and release, with moments of nail-biting tension being relieved by big belly laughs. 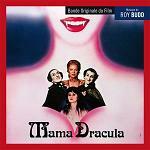 "Mama Dracula" from 1980 by writer/director Boris Szulzinger fits perfectly into this mold, with the clever plot twist that Mama, a female vampire who rejuvenates by bathing in the blood of virgins, finds that virgins are increasingly hard to find in modern times. The film stars Louise Fletcher (as Mama Dracula) and Maria Schneider, and the music score was provided by acclaimed jazz pianist turned film composer Roy Budd. Although a comedy horror film gives a composer the opportunity for some musical fun, they must also be careful to balance the two competing elements thoughout the film. Key to the Roy Budd's sound for Mama Dracula is the combination of a cimbalon and a harpsichord, which seems to hark back to the Vampires' origin in Transylvania while also underscoring their longevity. The rest of Budd's instrumentation is equally transparent, letting solo instruments and small groupings lead the way, but supported when necessary by the full string section of the National Philharmonic Orchestra. Budd is also economical with his melodic palette. After a jaunty waltz, he uses strings to introduce his main theme in "Invitation to a Blood Convention": a dark minor-key melody with a characteristic downward phrase of 3 notes. The cimbalom is heard clearly in "To the Castle Dracula", emphasising that 3-note morif and establishing the atmosphere for the entire score. In a complete contrast, "Mama's Story" starts with an upbeat version of the same theme, suggesting travelling at speed through the countryside. While the main theme forms the backbone of the score, Budd conjures up some many different variations. "The Castle's Laboratory" introduces a new theme on solo trumpet using a mute to comedy effect. This theme then returns later in "Morning Vamps" played in equal comedy fashion on a Tuba before handing over the melody to a saxophone accompanied by a jazz double-bass. Jazz is heard also in other tracks such as "The Angry Villagers" with its Latin beat, and some old-style 'vamping' in "The Vamp Show". Then "Tango Vampo" plays a short but fun Tango version of the main theme with accordian and castanets. The fun continues in "Nancy Speaks" whose Eastern flavour sounds as though it might accompany a belly dance. The score concludes with a reprise of the Main Theme as a slow jazz waltz. Roy Budd didn't score many films during his tragically short life, but he displayed a natural talent for the job, crafting music to provide a unique mood for each film regardless of genre. 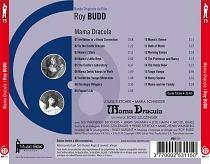 This newly remastered version of Roy Budd's Mama Dracula is a great addition to any soundtrack collection. The album is available at Amazon.co.uk and also directly from Music Box Records.